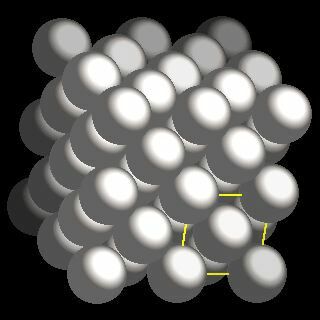 Platinum atoms have 78 electrons and the shell structure is 2.8.18.32.17.1. The ground state electronic configuration of neutral platinum is [Xe].4f14.5d9.6s1 and the term symbol of platinum is 3D3. Platinum: description Your user agent does not support the HTML5 Audio element. Platinum is a beautiful silvery-white metal, when pure, and is malleable and ductile. It has a coefficient of expansion almost equal to that of soda-lime-silica glass, and is therefore used to make sealed electrodes in glass systems. The metal does not oxidise in air. It is insoluble in hydrochloric and nitric acid, but dissolves when they are mixed as aqua regia, forming chloroplatinic acid (H2PtCl6), an important compound. It is corroded by halogens, cyanides, sulphur and alkalis. Hydrogen and oxygen gas mixtures explode in the presence of platinum wire. 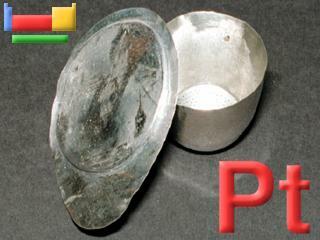 The above shows a platinum crucible. The solid state structure of platinum is: bcc (body-centred cubic). Reactions of platinum as the element with air, water, halogens, acids, and bases where known. Binary compounds with halogens (known as halides), oxygen (known as oxides), hydrogen (known as hydrides), and other compounds of platinum where known. Bond strengths; lattice energies of platinum halides, hydrides, oxides (where known); and reduction potentials where known. Platinum was discovered by Antonio de Ulloa in 1735 at South America. Origin of name: from the Spanish word "platina" meaning "silver". 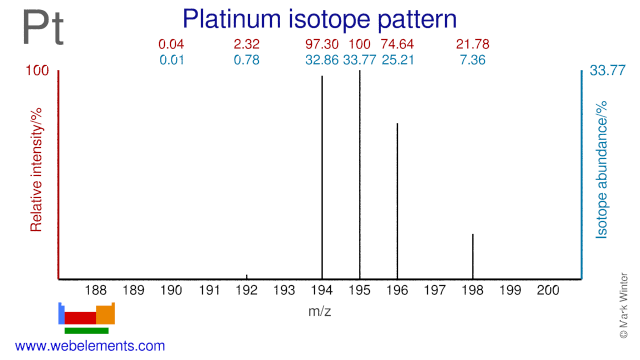 Isotope abundances of platinum with the most intense signal set to 100%. Isolation: it would not normally be necessary to make a sample of platinum in the laboratory as the metal is available commercially. The industrial extraction of platinum is complex as the metal occurs in ores mixed with other metals such as palladium and gold. Sometimes extraction of the precious metals such as platinum and palladium is the main focus of a partiular industrial operation while in other cases it is a byproduct. The extraction is complex and only worthwhile since platinum is the basis of important catalysts in industry. Preliminary treatment of the ore or base metal byproduct with aqua regia (a mixture of hydrochloric acid, HCl, and nitric acid, HNO3) gives a solution containing complexes of gold and palladium as well as H2PtCl6. The gold is removed from this solution as a precipitate by treatment with iron chloride (FeCl2). The platinum is precipitated out as impure (NH4)2PtCl6 on treatment with NH4Cl, leaving H2PdCl4 in solution. The (NH4)2PtCl6 is burned to leave an impure platinum sponge. This can be purified by redissolving in aqua regia, removal of rhodium and iridium impurities by treatment of the solution with sdoium bromate, and precipitation of pure (NH4)2PtCl6 by treatment with ammonium hydroxide, NH4OH. This yields platinum metal by burning.